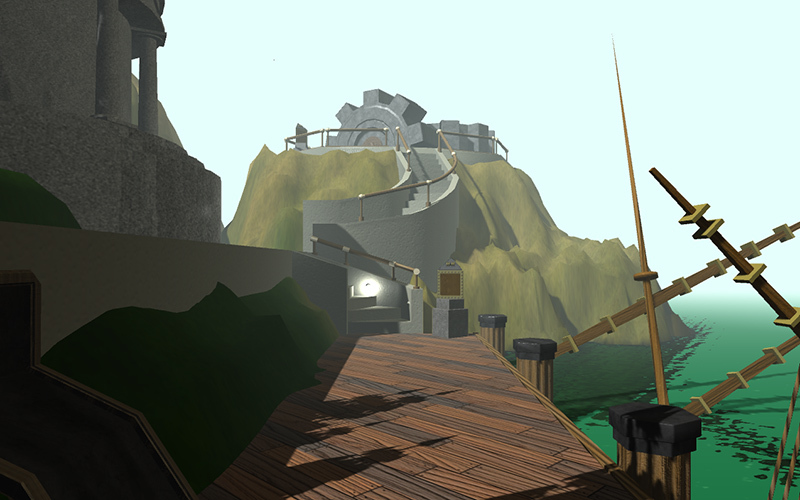 As the title says: I am working on a small Myst-related project Myst Island in VR. Nothing exceedingly original, but something I dearly want to experience.. I’ve had an Oculus Rift (DK2) for a while, enjoying other people’s projects but lacking a project of mine. As I’m waiting for Korman’s documentation to grow a bit (*hint*hint*) to make progress on my current Age, I’m working on that these days. 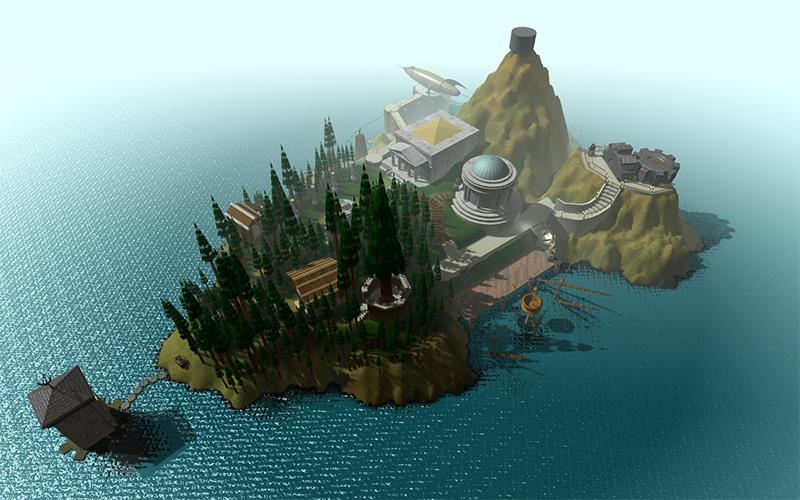 I totally love Myst island (duh). I love the original game, and as much as I love RealMyst, I have always wanted to explore Myst island in real time the way it originally looked when I first played it.. So I’m going for something that looks as close to the original as possible. ’Warts and all’ as they say. I’ve had to funky things to do this since I took the time to count the actual number of polygons on some models (not as difficult as it sound) and I had to count and map out all the trees in the forest.. (by my estimation there are 363 of them :O many of them are super tiny). Doing all this is actually easier than it sounds since the island isn’t too big and we have an accurate map (from MystMME). This started as a UDK project a bit over a year ago (I’ve had Myst island’s outdoors modeled years ago, so I finally decided to do something with it). I had all assets integrated, and shaders done, but then the Epic guys dropped Oculus Rift support for UDK — in favor of the new Unreal Engine. Unfortunately the newer engine actually dropped a couple features I totally needed for that project (mostly the way it used to handle reflections). And one year later they are still not back in, with no plans to do so. So I am moving the whole thing to Unity. Moving it Unity is problematic for me on two specific areas: programing, and shaders. Both have great visual scripting interfaces in UDK/UE4 which Unity lacks. Sure you can get part of that through external plugins, but those can be expensive. Not the kind of stuff you buy just for fun. When it comes to shaders I had all of those running in UDK, including a fairly complex one for the sea. But changes within UE4 shaders system are part of the reason I had to drop the thing, so no choice here for me but to move to the next best thing, Unity. I’m currently looking at getting a Unity shader plugin (Shader Forge), which is basically a clone of UDK’s system and works great. All of the island’s outdoors are modeled, textured, and animated. Safe for the terrain that still needs some work. I haven’t done the indoor areas yet, and at this point I’m not sure I will have any (safe for the library). This is a small project, that’d go beyond the scope. There is no interactivity at all right now. And again at this point I’m not sure I will have any. This is a small project that’s all about exploring. I might add the clock tower ‘gear path’ puzzle so we can walk to the clock tower, that wouldn’t be too much work. I would love to be able to raise and lower the big Channelwood Tree, because it gives such a great point of view. But the ‘real’ puzzle would require doing the cabin; too much work.. Maybe I’ll code in some cheat system. I’ll look into that at the end. Finally: I haven’t contacted Cyan yet to get their legal green light to publish this. I’ll do that once I have something that looks good enough. For instance I’m currently using the actual Myst sound effects; that might have to change. Doing VR games is not easy, many people (among which I was) assume that we can take a regular game, add a VR controller script and be done with it. If only. Myst has several issues regarding this. It was not designed for real time 3D in the first place, many things were not built to scale etc.. RealMyst circumvents this in various ways that are problematic for VR: it changes camera FOV on the fly, it moves the player around, collisions tricks are used to make the player feel taller/smaller etc. All of those are big no-no for virtual reality.. The only ‘correct’ way I could think of to correct those would be to redesign some of those areas. Which is obviously something I am not going to do. Thankfully all of those problems arise inside the buildings, and I have no intention to do those. 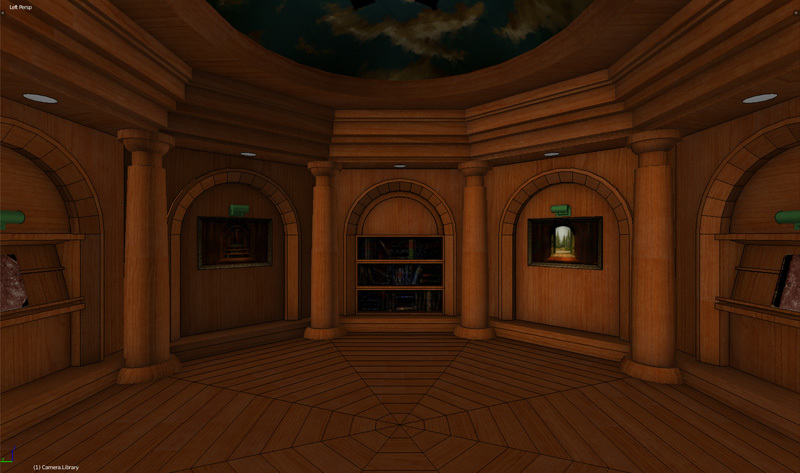 I will make the library though, but this particular area doesn’t look problematic, so I should be fine. Another ‘problematic’ aspect of VR is navigation. Simple first person FPS-style navigation can make some people’s stomach uneasy. 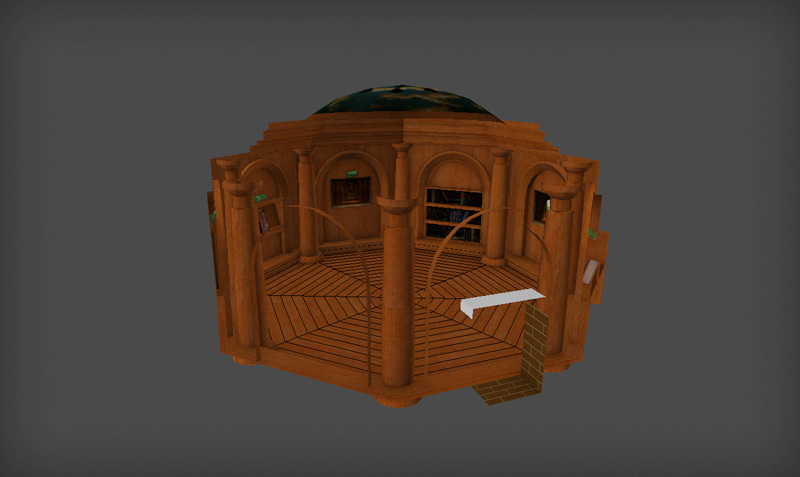 I’m a big fan of the ‘hotspots’ navigation system in Myst5 (has RealMyst MME anything similar?) so I will go with that; along with an option for regular FPS control. I have already mapped out the existing navigation points on the island (all 38 of them; minus the sunken ship). Wow! You are a crazy man! 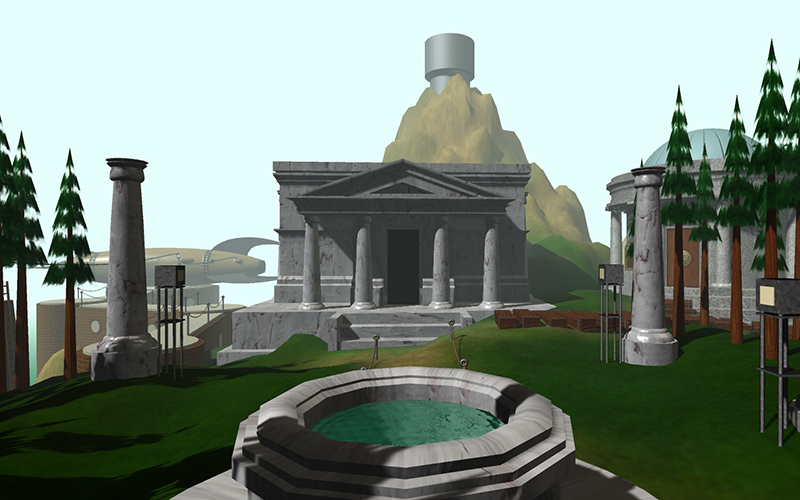 I’ve always wondered why they made realMyst look so gray and dirty compared to the bright and sunny original, but you have reproduced the feel perfectly. Great job! Ainia wrote: Oh my WOW! Thanks. I'm doing my best.. I love the work Robyn Miller did on Myst island, gotta pay a good homage to it. Christian Walther wrote: Wow! You are a crazy man! 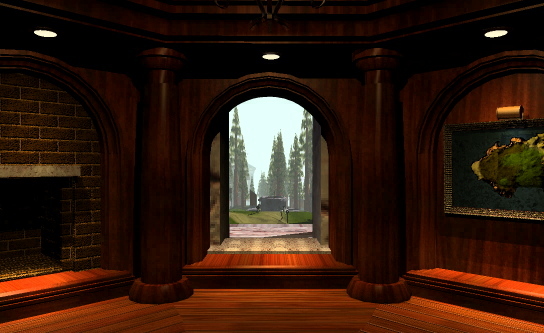 I'm glad they did realMyst at the time, but I do have a soft spot for the original color palette.. I have to say, very nice work ! It totally looks like the original game, from what I can see. (after looking at pictures from the original, I can see very light differences, but overall, great job). Nope. The navigation system and control scheme of RMME looks a bit like the original realMyst, but even... weirder (to be honest, in my opinion it's possibly one of the worse navigation system ever invented). Oh yeah. 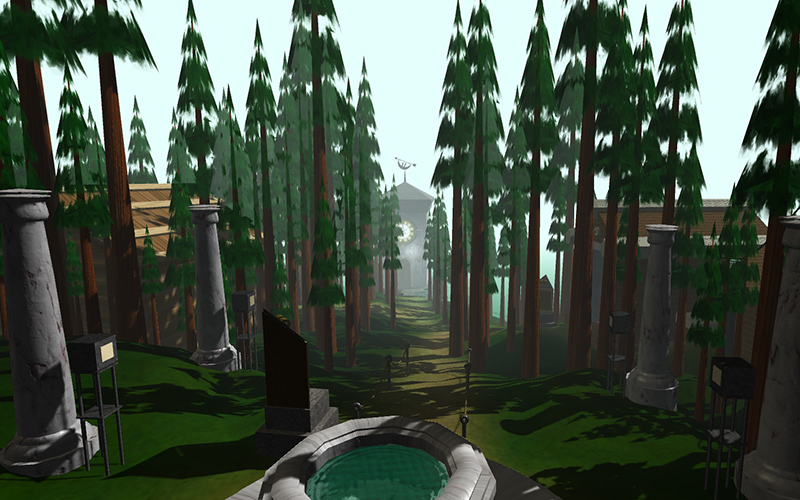 The guys who made the original realMyst must have had headaches making it. 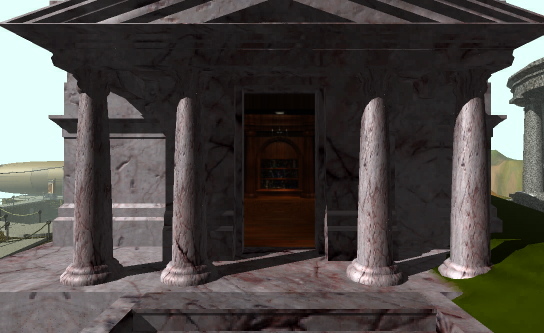 Yeah, some places are simply too small to look nice in realtime 3D, so they forced the FOV to be smaller in interiors (very weird once you start to notice it in-game), and used a LOT of tricks to hide the fact that lots of places are actually bigger on the inside (<insert Dr Who/Tardis joke here>). Anyway, a while ago I tried to recreate Mechanical from scratch in Blender, and had nasty surprises with scale too. Maybe because of the day/night cycle, which means too bright lighting would end up completely wrong on the old engine... Myst is sunny again in RMME, probably because it supports dynamic lighting and shadowing. Sirius wrote: I have to say, very nice work ! It totally looks like the original game, from what I can see. (after looking at pictures from the original, I can see very light differences, but overall, great job). 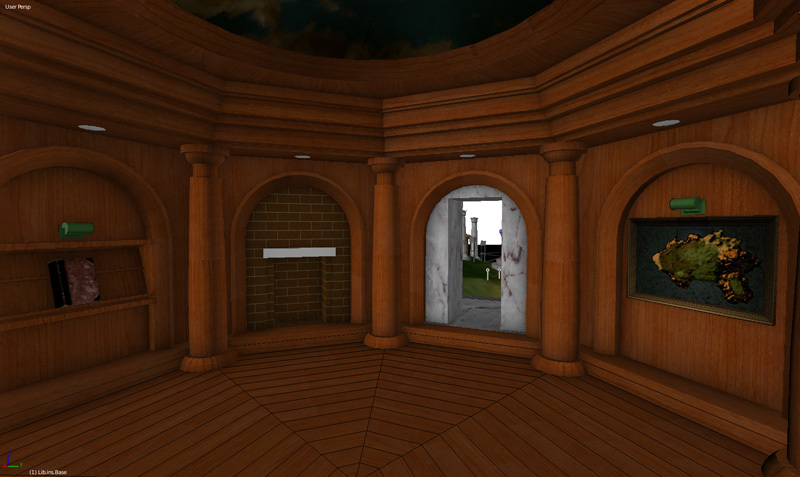 I might actually have to use portals for the library: I'm not sure I will be able to fit the whole room in the building (it's a pretty tiny building, but the planetarium is far worse). In VR you cannot change the camera FOV, well you can but you shouldn't. Portals are doable in Unity, they are not supported natively, but it's possible. So I might have to do that. I'll be doing the library over the week end and I can't wait to do it: I have being waiting for an excuse to re-create that place for years. Modelling is done, texturing only had a first pass. Useless statistics of the day: there are 90 individual wood planks on the floor, and 16 rows x 5 columns of bricks on the fireplace.. Didn't the door of the library take up the whole arch? As in, there wasn't a rectangular doorway. It's another situation where they cheated and I have to deal with it somehow.. Right now what I have done is that the arch is just larger than the door frame so that it doesn't show from the ouside, as it looks pretty weird. But I do have a pretty noticeable mismatch with my dimensions here, I have yet to fix it. :/ I'll have to look at realMyst again to see how they copped with this.